Flat roof tops, tightly clustered houses and narrow streets suggest a near Eastern location. The nativity stable sits on top of the hillside, dominating the village. Although steep and narrow, all roads lead to the manger. Not only beggars, but also kings have to climb the hill of Christ's presence. However long the way, however many the obstacles, the goal, the manger, remains visible from all directions, and the angel is there to encourage the tardy and the lazy and the confused. This set is part of the vast Fontanini assortment of figures and accessories, a long-standing Italian Christmas tradition with frequently added elements. 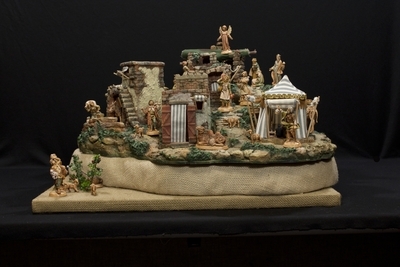 Nativity set made primarily of resin, wood, plastic, and cloth depicting the infant Jesus, Mary, Joseph, and various other figures and animals, including the Three Kings, shepherds, angels, and animals including sheep and camels. Exhibition label written by Father Johann G. Roten, S.M. originally for exhibition entitled "No Place Like Home" held at Roesch Library, University of Dayton.